Popular Diamond Earrings Collection by Diamond Essence is filled with beautifully crafted designs. You can choose from delicate or intricate earrings from a variety of styles that can compliment any fashionable attire. Diamond Essence 14K Gold Vermeil Screw Backs. French Backs For Non Pierced Ears In 14K Gold Vermeil. Diamond Essence Platinum Plated Sterling Silver Screw Backs. A square princess cut brings out the brilliance of these Diamond Essence studs in Gold Vermeil. 1.50 cts. t.w. Diamond Essence Clip-On Hoops with Round Brilliant Stones in Gold Plated Sterling Silver, 1.60 Cts T.W. Diamond Essence Platinum Plated Sterling Silver Clip On Earrings with Sapphire Essence Floral Design, 1.20 Cts.T.W. For Pink Essence Item # SEC990P. For Blue Topaz Item# SEC990BT. Diamond Essence Platinum Plated Sterling Silver Clip On Earrings with Blue Topaz Essence Floral Design, 1.20 Cts.T.W. Diamond Essence Halo Setting Platinum Plated Sterling Silver Earrings, with 1 Ct. each Round Brilliant Center surrounded by Brilliant Melee, 2.25 Cts.T.W. 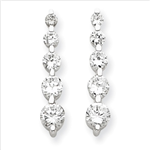 Diamond Essence Dangle Earrings With Baguettes And Pear Shaped Stones, 4.50 Cts.T.W. In Platinum Plated Sterling Silver. Diamond Essence Anchor Shaped Earrings With Beautiful Round Cut Stones, in Platinum Plated Sterling Silver, 1.10 Cts.T.W. Diamond Essence Drop Earring with graduating round brilliant stones, 0.80 Ct.T.W. set in Platinum Plated Sterling Silver. Length 21mm and width 4mm. 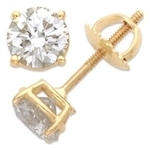 Designer Stud Earrings. One carat Sapphire Essence Asscher cut stone in four prongs setting and surrounded by Diamond Essence melee. 3.0 cts.t.w. in Platinum Plated Sterling Silver. Diamond Essence Designer Earrings with Round Amethyst Essence, 1.50 Cts. T.W. in Platinum Plated Sterling Silver. Brilliant Stones Giving a Two Tone Blend With A Clip-In Lock Type,0.70 Cts.T.W. Diamond Essence Clip-On Hoops with Round Brilliant Stones in Platinum Plated Sterling Silver, 1.60 Cts T.W. Approx Length Is 18 mm and 4.50 mm Width. Popular Diamond Essence Earrings.Diamond Essence carries a wide variety of popular earrings at affordable prices. Browse the extensive selection of 14k gold, white gold and sterling silver simulated diamond earrings. Whether you prefer heart shaped, round, square, marquise or any other shape of imitation diamond earrings, Diamond Essence has it! There is a shape and setting for everyone’s unique taste at a remarkable price. Diamond essence also offers unique hoop earrings, danglers, stud earrings, gemstone earrings. Now you can wear the beautiful simulated diamond earrings even if you don’t have you ears pierced! 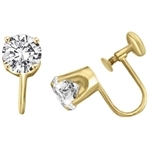 The french back imitation diamond earrings are perfect for non pierced ears. The French back simulated diamond earrings come in gold plated, platinum plated , 14k gold and white gold. 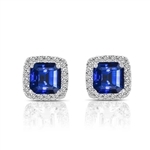 Stimulated diamond earrings are a great way to show your friend or loved one how much you care. Purchase a pair of imitation diamond earrings and give them a gift that they will cherish for a lifetime! Call the Diamond Essence experts at 1-800-909-2525 if you need help picking out the perfect pair of popular Diamond Essence Earrings.